A recent Gary Scott message entitled ” Cotacachi Real Estate Resales ” explains why Cotacachi real estate is booming on four levels. 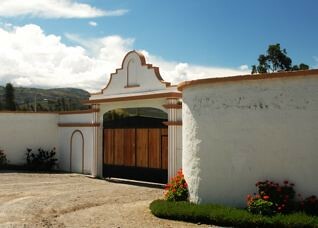 Here are the gates of the San Miguel real estate development in Cotacachi. First it shows how the locals have a booming economy and are building on their Cotacachi real estate. Second, during the late 1990s many Ecuadorians left their homes and moved abroad for better jobs. They come back once a year and invest their hard earned savings into property here. Third, the Spanish and Italians are catching on and are investing. Finally fourth, North Americans are moving down to live. 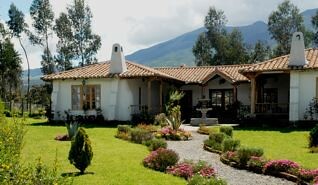 Cotacachi real estate is great value. You can read this original article which looks at San Miguel development resales at . 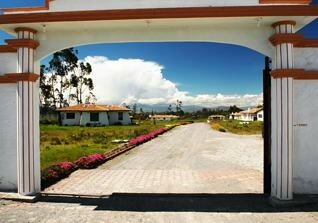 You can read this message and see pictures of Cotacachi Real Estate Resales. Here is an updated report about San Miguel in Cotacachi from Deborah Nance. “Since I last wrote from Cotacachi, one more of the original San Miguel lots has sold. This is Lot #15, the one in the corner closest to La Mirage. I am told it is being purchased by another Ecuadorian couple who have lived and worked in the US and are returning to Ecuador for their retirement. This seems to be a trend, with the last three sales to returning Ecuadorians. Ecuadorians know the country and the culture, so their choice to live in San Miguel, rather than the many other developments that are springing up, says a lot to me. We are delighted to have more neighbors who have experience with Western culture and Ecuadorian culture. We are pleased to be a mixture of Ecuadorians and Westerners. This can only help us all to blend into the community of Cotacachi. Out of 36 lots in San Miguel, 34 have been purchased. This has a lot to do with why we have a resale market. With only two more lots to go, the only way to buy into San Miguel in the near future, will be to buy a resale lot or home. I know of many other developments around, but none that have sold more than a handful of lots, and so far I have seen only one house go up on one other development in the past two years. What this means to a buyer is significant. If you buy a lot in a development that has only sold a few, what happens if you want to sell down the road? Who will buy your lot at a premium when there are twenty or more original lots for sale? If you price your lot the same as the original lots just to make the sale, how do you recover the costs of closing, and realtor costs? You have to take a loss just to get out from under the property, and in the mean time you may have incurred maintenance costs as well as property taxes. If you buy because you want to build and live in one of these new start-ups, if you are the first and only house, don’t expect a fully staffed development. Unlike developers in the west who build the gate and fence and communal areas first, here in Ecuador developers tend to do that last or at best, when they feel they are successful enough in selling lots and homes to warrant it. It took three years of constant coercion to get the developer of San Miguel to finish the security fence and make this a true gated community. While violent crime is not a problem here, theft is a problem. Until the fence was finished we did have things stolen in spite of the group of owners who paid maintenance fees to employ two night guards. The developer constantly promised it to everyone. But if Bob had not stepped in to manage this development, we would still be without security. This brings up another point. Many Ecuadorians will tell you what ever they think you want to hear. They like to see you happy. They want to make you smile and feel content. If you ask them a question and they don’t know the answer, they will make up an answer they think will please you. I don’t believe they set out to deceive you as much as they just want you to be happy in the present moment. To their credit and health, Ecuadorians live in the present and are not rushing into the future or dwelling on the past. But for a Westerner, it can be quite an adjustment when you can’t take people, particularly developers, at their word. For example, something that is illegal but happens quite frequently is that a developer will sell you land that he doesn’t own. One house in San Miguel is currently being purchased by a couple of men who had this problem. Developers will make some kind of arrangement to buy the land for the development, when and if they manage to sell enough lots to come up with the money to afford it. These two men were able to get their money back, but not without the expense of hiring a lawyer. One way to know if this is going on is to check and see if others who have purchased a lot have gotten a deed. This is a boilerplate legal form that takes no time at all to process. Bob can get the deed for any buyer in about three days. If a developer gives you an excuse for not getting the deed to you promptly, he is selling you land he doesn’t own. This, I’m told, is against the law. And another big problem is that you will not qualify for your investor’s resident’s visa without a deed. You may have invested enough money to qualify to stay in Ecuador as a resident, but without the deed, you will be forced to leave. Deborah is right the photos included here do show what wonderful natural scenic beauty San Miguel and Cotacachi have. We thank our friend Dennis Goff for these excellent shots. There are houses and lots for resale in San Miguel.